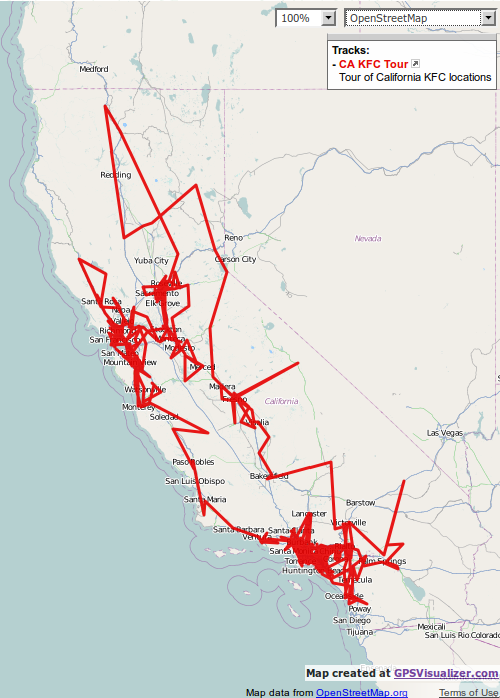 Inspired by a Hacker News comment, I wrote a Python script that queries the KFC website for store locations, finds the optimal tour with the Concorde cutting-plane-based exact TSP solver, and generates a KML file that can be plotted in Google Earth or GPS Visualizer. It currently only works for California, because the web service used by the KFC Store Locator has a maximum search radius of 1,000 km, and I don’t have a way to generate centroids of overlapping circles for the entire U.S. The source code and more information are on GitHub.